Construction, demolition and landclearing debris (CDL) is all non-hazardous solid waste resulting from construction, demolition and landclearing (CDL) activities. By the above situation, Shanghai Shibang corporation, has successfully explored a new technology of utilizing the construction waste after years of reseach. Using the special machinery, the construction waste is crushed and screened, then is widely used in concrete brick, pavement and construction. This new technology has truly reused the construction waste, will benefit the state and people. And it provides a new development idea for the urban development. During the construction waste crushing process,we offer the best vibrating feeder,jaw crusher, impact crusher, vibrating screen, belt conveyor and other related equipments. We will work together with you and push ourselves to work hard for the civilization of the city. The current construction waste recycling already have some technical basis, regardless of the laboratory research or market applications have certain results. SBM self-developed hydraulic drive track-type mobile crusher station and tire mobile crusher station, the construction garbage coarse broken, the broken and broken bits, according to the different needs of different customers to flexibly configure a crushing, crushing two and three Grade crushing mobile crusher station equipment, while at all levels to optimize the combination of crushing and screening, we will do our best to meet customer needs. With regard to mobile crusher station "broken after the first screening" of "first screen after the broken" and detailed process. 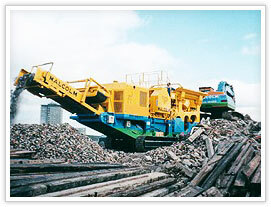 Many of the waste of construction waste through sorting, remove, or crushed, the majority can be used as renewable resources, re-use such as: scrap steel, scrap wire, scrap wire, and various accessories and other metal scrap, after sorting, concentration, re-melted again after the processing and manufacturing into a variety of specifications of steel; waste timber bamboo can be used to make artificial wood; brick, stone, concrete and other materials through the crush, they can on behalf of the sand used in masonry mortar, plaster mortar, playing concrete cushion and so on, can also be used to produce building blocks, paved Road, brick, tiles and other building materials lattice.